Having said this, there are certain brands I associate with certain "looks". 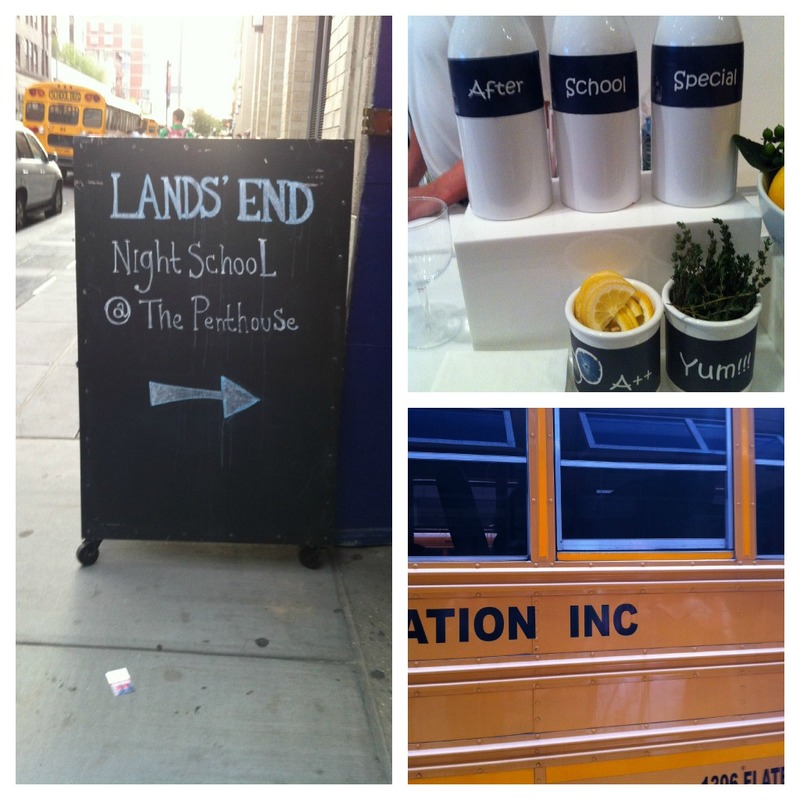 When I think about Back to School, for kids AND their parents. . .the first brand that comes to mind is Lands End. Imagine my delight when the ladies at MomTrends and the folks at LandsEnd, invited me to their Night School event during BlogHer. Despite the extreme heat, I could barely contain my excitement (just ask Sherry) as I climbed onto the very first school bus that loaded up to take the group of savvy bloggers over. Lands End hit it out of the park with their creativity. I grabbed my report card and took off to check out all the stations they had set up. First up - backpacks. We still have the Lands End backpack Ryan picked out when he started kindergarten in 2006. . .it looks brand new, and he used it all 180 days of kindergarten (AND rode the bus). But because I love Back to School, we indulge every year and let Ryan pick a new backpack every year. This year, Owen is thrilled that he gets to pick one out too. 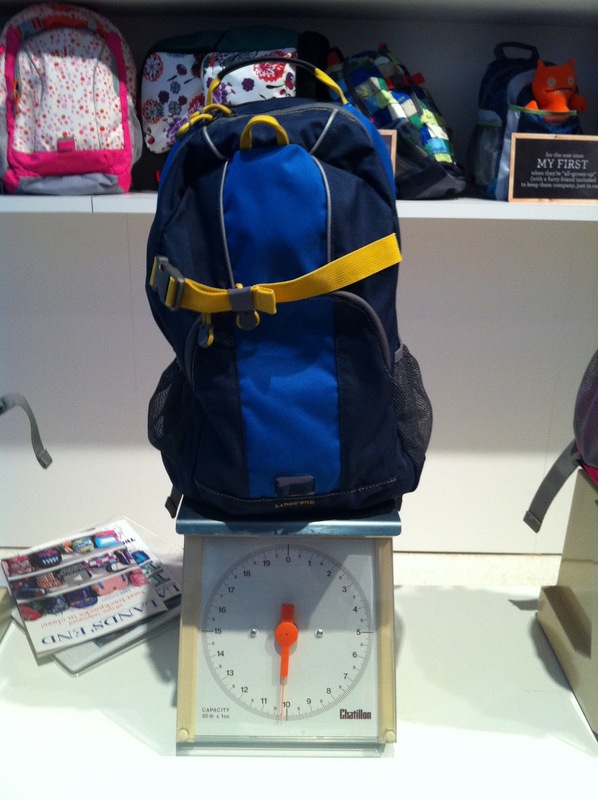 So, Lands End is my go-to brand for all things backpack and lunch bag - and they have been for seven years. Next stop, clothes. Can you remember the thrill of picking out your first day of school outfit? I recall CLEARLY having a pile of new fall clothes, and it being too warm out to wear any of them. My boys grow like weeds. The beautiful part of having two boys, born six years apart but in the same season, is hand-me-downs. And the Lands End clothes I bought for Ryan have weathered the years so well and now look new on Owen. Do your kids (ok - boys) wear out the knees in their pants? This was a terrible problem for us when Ryan in kindergarten - so sadly, no pants to hand down to Owen for this year. 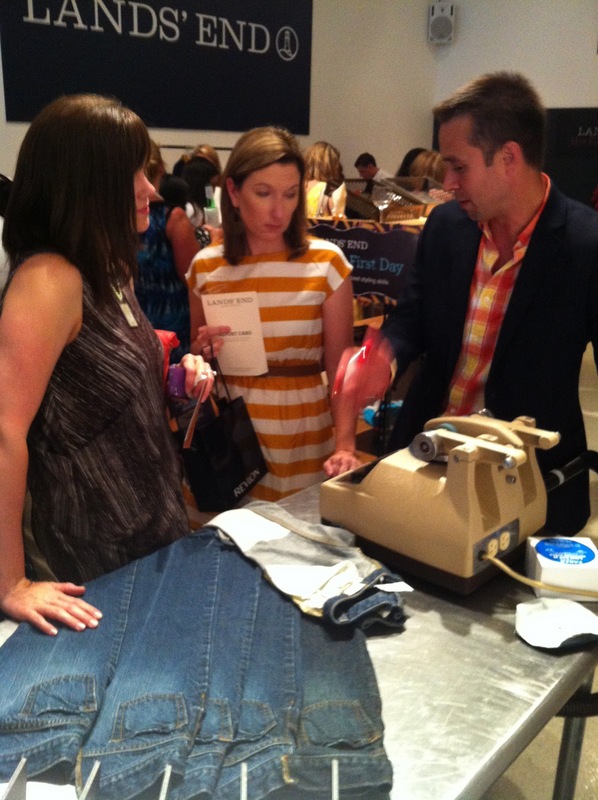 At the event, Lands End introduced us to their Iron Knee Pants (not actually made of iron) . They even abrasion test them for quality. Besides getting taller everyday, my oldest is skinny. . .my youngest is regular (at this point). Lands End has adjustable waist jeans up to a boys size 14, that have been a GODSEND. They also make slim, husky and regular fit so that your child can get just the right fit. Let's not forget mom. . .(maybe dad too). I'll need something to wear to the PTO meeting, Back to School Night, the Goblin Gala and more. I find I can rely on Lands End for reasonably priced, top quality pieces that I can mix and match into my own wardrobe to create looks for just about any occasion. 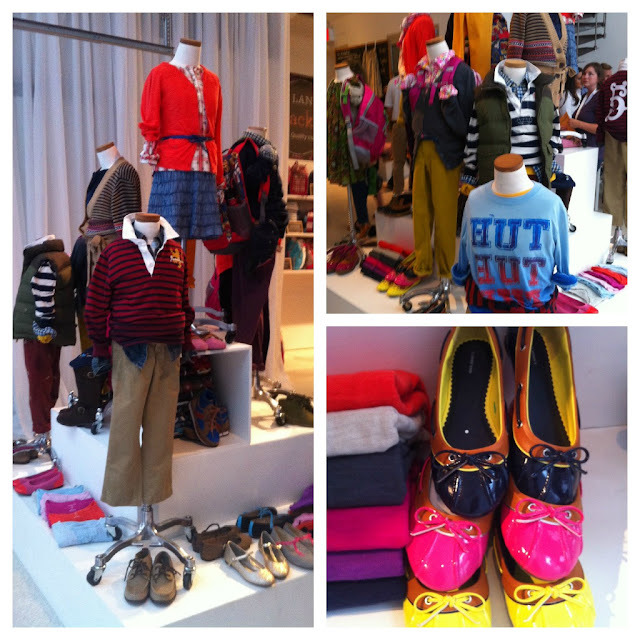 What are some styles you and your kids are hoping to rock for Back to School? note - by writing this post, I am entitled to receive a gift from Lands End. I would have gladly written this post regardless, and as always all opinions are my very own. I love Lands' End and agree that the backpacks last forever. 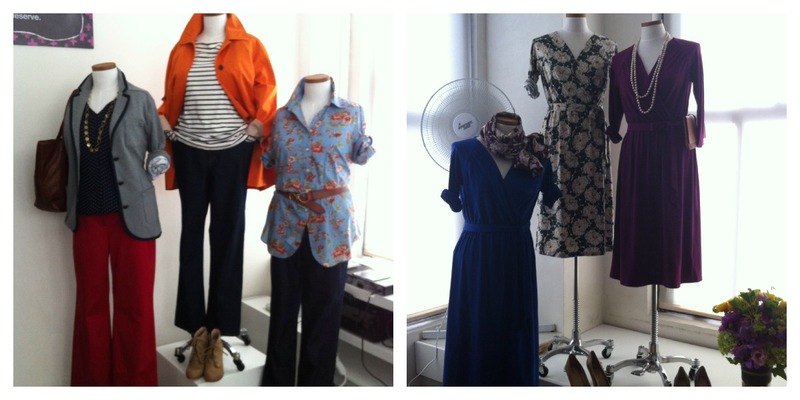 Love those wrap dresses in the picture above, I'm sure they are more affordable than DVF. Will be checking them out soon. I love Land's End. Not only do their backpacks last forever, but so do all of their bags. Each member of our family has one of their overnight bags. My beach bags is about five years old and looks brand new. Love them! I love lands end quality the best. I am also a fan of the Guarantee. I love the orange jacket with the striped shirt. I did not know this about the adjustable waist jeans! Thank you! We need those for Boo (and immediately, I might add) because he is so short yet ... stocky, shall we say ... in the waist. Impossible to find pants for, and so he tends to spend his life in sweats or shorts. As a boy, this makes him relatively happy. As his mom, not so much for me. This is good to know - also about the backpacks, because I am tired of buying ones that only last until Christmas. My daughter would never wear pants if it was not for the adjustable waists! I am thinking they need these for adults too...could come in handy (by um, me). I'm bummed i didn't make it to that event, I underestimated the crowds and traffic and elevator time :) would love to get shaun a good backpack like that one. They really outdid themselves on the theme of their party. I'm a big fan of Lands End. Can't think of one thing I don't like about them!